If they have won, the article usually writes itself – good performance, good win and everything’s positive. If the outcome of the match is a defeat or even a draw (Linfield fans expect the team to win every match going, locally) then you approach the column with a certain feeling of trepidation. Publicly criticising either the players or the management is never desirable, but sometimes it is a necessity in order to improve. Last week’s column focused on a disappointing performance and result at Shamrock Park, and whilst this week has yielded two victories out of two for Linfield – there has been more criticism than praise directed at the team, and rightly so. Following last week’s debacle at Portadown, the Blues faced a trip away to Ballyclare Comrades on Tuesday night in the Irn Bru League Cup. The excitement of the match was as good as Linfield’s performance was bad. Whenever Patterson and Aaron Burns gave the visitors an early two-goal lead, it looked like it would be a stroll in the park and a potential landslide victory. However, against the odds, the Dixon Park outfit fought back and deservedly went in 2-2 at half time following an unforeseen resurgence that a shell-shocked Linfield couldn’t resist. As expected, Linfield made wholesale changes from the defeat at Portadown – the two early goalscorers were the only players to start both games. The unconvincing first half performance saw Robert Garrett introduced, and he immediately made an impact – putting Linfield 3-2 up with a neat finish. Then, it all seemed to go wrong yet again. First McClelland drew Ballyclare level, and then Sharples put them into a shock lead with only 15 minutes left to go. The clock ticked into injury time and Linfield looked to be crashing to their most embarrassing defeat in David Jeffrey’s 14 years at the helm. Then, out of nowhere 37-year-old centre half William Murphy popped up in Ballyclare’s penalty area and smashed the ball into the roof of the net to drag the game into extra time. The Blues’ superior fitness told – goals from Mark McAllister and a second from Patterson spurred the blushes of Linfield, who eventually ran out 6-4 winners. But it was a narrow escape. Conceding four goals against a team two divisions below is nothing short of a catastrophe. Many of those ‘squad’ players who participated will have to take a long, hard look at themselves, as that is not the standard expected or required. Linfield have been drawn at home to struggling Glenavon in the forthcoming round and the game will take place on Wednesday 12 October. Linfield kept themselves on top of the Carling Premiership by the skin of their teeth as they brushed off Carrick Rangers 3-0 in last Saturday’s match at Windsor Park. Mark McAllister notched a brace of goals, either side of an Aaron Burns finish. Again, however, the performance left a lot to be desired. It was not a match for the purists – chances were limited and the play was disjointed. The continued absence of central midfielder Jamie Mulgrew has hindered Linfield as it has severely limited the creativity of the team, as has the continued exclusion of set-piece specialist Nathan Hanley. Gary Browne has also not returned to full fitness following his hernia operation from this summer. Another forward – Peter Thompson, will finally get an operation this week for his ongoing kidney problem. He has had the issue since the final few months of last season, and whilst he was given the all clear to continue training and playing matches, it was clearly affecting his overall game and contribution to the team. He has had to wait this long to get treatment on the NHS, and is set to be out up until the New Year period. Thompson’s lay-off will mean even more pressure is put on Rory Patterson. The loan signing from Plymouth Argyle netted an incredible 50 goals in his spell at Coleraine two seasons ago. The problem this time around is that his service has been restricted this season due to experimental formations that seemed to have failed. Thompson’s unselfish play is undoubtedly being missed, and while McAllister scored twice on Saturday his game relies on his work ethic and not his goalscoring ability. The decisions to offload winger Jamie Tomelty and attacking flair player Curtis Allen (to Portadown and Coleraine respectively) looks in hindsight to be errors of judgement by the Linfield management. 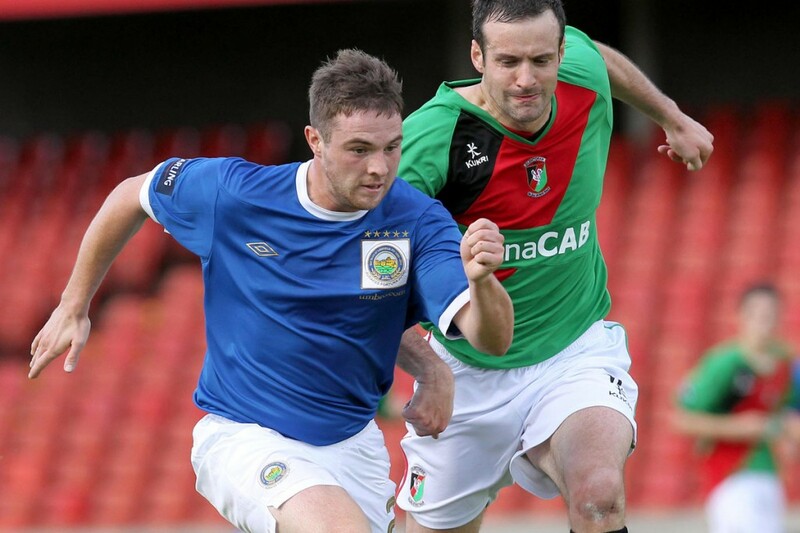 The Blues’ next opponents are Cliftonville, with the match to be staged at Windsor Park on Saturday afternoon. The Reds have a very strong recent record against Linfield and will no doubt be trying to lift their game and go all out for the three points.